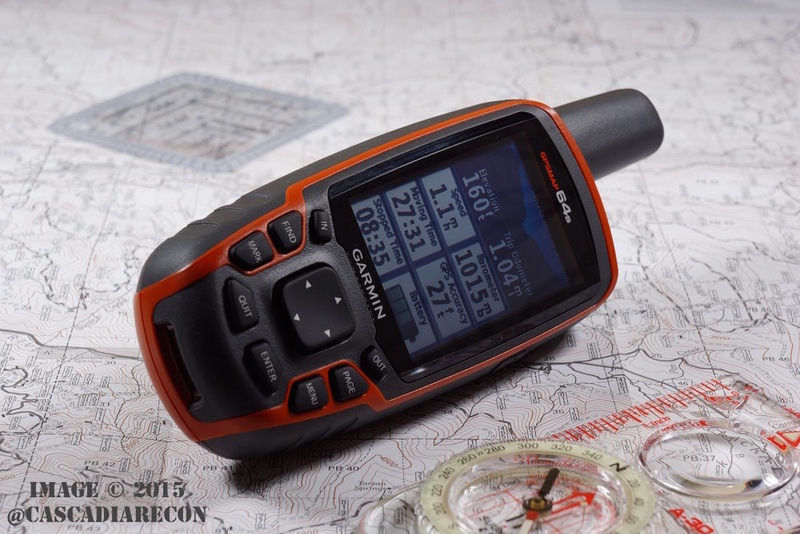 Today’s review brings us the Garmin GPSMAP 64s, which is an ongoing evolution of the previous GPSMAP 60 and 62 series units. The GPSMAP 64s is a handheld unit that sports a quad-helix antenna, and not only receives traditional GPS and WAAS signals, but also the Russian GLONASS satellite navigation system. Being able to receive GLONASS signals means that you should have an easier time getting an initial fix, as well as maintaining a good satellite lock in more rugged terrain — such as in canyons and under thick canopy. (For that matter, it should benefit users in built-up urban areas, too.) For folks in the northern latitudes, the GLONASS reception really does seem to help quite a bit. There are three models of the series — the GPSMAP 64 (base model), the GPSMAP 64s (magnetic compass & barometric pressure sensors, plus bluetooth), and the GPSMAP 64st (adds 100K scale topo maps to 64s). One nice improvement that isn’t widely publicized is that even the base model GPSMAP 64 now has a micro SD card memory slot. (On the previous GPSMAP 62 series base model you were limited to internal memory only.) The LCD screens are the same between all GPSMAP 64 units, and feature a 160 x 240 pixel, transflective TFT 65K color display. This means you can easily see the screen and make out details without needing to turn on the backlight, helping to conserve power and battery life. Speaking of battery life, on paper the GPSMAP 64 series has a specification from Garmin of 16 hours. This might be a little optimistic, though for the best performance you should definitely use NiMH rechargeable batteries (Eneloops are great for this task), or lithium cells if you’re looking to save a little weight. There is a battery saver mode on the unit, which can be turned on/off, and simply times out the display screen to save power. Pressing any button then wakes the display, with the GPS still running in the background the entire time. This is handy if you are keeping the unit in a backpack and recording a track log — there is no need for the screen to stay on. If you are a geocacher, the GPSMAP 64 series can hold a nearly unlimited amount of caches. It can accept the typical .GPX files, as well as Garmin’s proprietary .GGZ file format. Out of the box, the unit comes pre-loaded with 250,000 geocaches (stored as .GGZ files). These can be removed if you wish, by way of connecting the GPS to your computer via the USB cable and opening the appropriate folder. Another perk is that the units provide a separate zoom level setting for caches when viewing the map screen. This means that you can zoom out and still see your personal waypoints, but without thousands of geocaches cluttering the rest of the screen. One thing that is noticeable with the GPSMAP 64s is that the odometer reading quickly racks up mileage, such as when sitting on a window sill. Other Garmin units appear to be attenuating this more aggressively. You can see this firsthand when watching the speed, moving time, and stopped time fields on the trip computer page when stationary indoors. All of a sudden the odometer might rack up a traveled distance of half a mile or more, and your track log will like a spider web. This is typically called “multipath” error. GPS devices tend to multipath when signals are reflected off of nearby surfaces, walls, etc. The GPSMAP 64 is probably a victim of its own sensitivity; the quad-helix antenna coupled with GLONASS capability results in excellent reception. And besides, in reality, GPS units aren’t meant to be used inside of buildings. As far as accuracy (actually EPE*) goes, the GPSMAP 64 shows a position fix down to 9 feet (3 meters). Pretty impressive! Having used both the GPSMAP 60Cx and GPSMAP 62s units in the past, the GPSMAP 64s feels very familiar. The firmware seems very stable, especially having had time to mature at this point. The dedicated front buttons are a nice step up from the eTrex series joystick controls, although if you do a lot of data entry in the field, you may prefer a touchscreen model. The GPSMAP 64 series has been on the market for about a year and a half now, which means that finding sale prices is not that difficult. For the feature set, especially if you do a lot of geocaching, this makes a workhorse of a GPS. All images and content are © 2015 by the author. No use without permission.